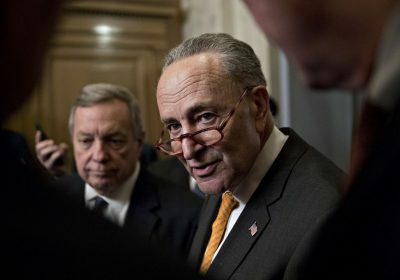 U.S. Senate Minority Leader Chuck Schumer says he will force a vote next week on a measure to block the Treasury Department’s plans to lift sanctions on three Russian companies linked to oligarch Oleg Deripaska, who is reported to be under scrutiny by Special Counsel Robert Mueller in his probe of Moscow interference in the 2016 presidential election. Schumer’s move comes amid a backlash from Democratic lawmakers suspicious of the Trump administration’s motives, and is aimed at forcing Republicans who control the Senate to take a side in the matter. “After consultation with the relevant committee ranking members and my colleagues, I have concluded that the Treasury department’s proposal is flawed and fails to sufficiently limit Oleg Deripaska’s control and influence of these companies, and the Senate should move to block this misguided effort by the Trump Administration and keep these sanctions in place,” Schumer said in a statement. He added that it wouldn’t be appropriate to lift the sanctions while Mueller’s probe continues. Schumer’s move would draw upon a provision in a 2017 sanctions law that lets him force a full vote in the Senate disapproving of sanctions relief within 30 days after it was allowed, but his success is not assured. Democrats have just 47 seats in the Senate, so some Republican support would be needed. A full 60 votes are needed to prevent opponents from blocking a final vote, and a simple majority of 51 votes in the GOP-controlled chamber is needed to bring it up and to approve it in a final vote. Also, the House also must act by a strict Jan. 17 deadline for sanctions to be retained. Democrats are concerned that the administration is easing pressure on Deripaska, an ally of Vladimir Putin, from sanctions intended to punish the Russian leader for interfering in the 2016 election. Democratic Representative Richard Neal, who heads the House Ways & Means Committee, wrote to Treasury Secretary Steven Mnuchin Thursday requesting a 28-day extension of a deadline for Congress to consider blocking the delisting. Mnuchin got backing Friday from the European Union, with ambassadors from the U.K., France, Germany and the European Union among those who signed a joint letter to Schumer and House Foreign Affairs Chairman Eliot Engel saying that lifting the sanctions would “safeguard” more than 75,000 workers across the EU’s aluminum industry. Mnuchin on Thursday briefed House lawmakers on Capitol Hill on his Dec. 19 announcement that he would delist United Co. Rusal, En+ Group Plc and a third company, EuroSibEnergo JSC. Lawmakers emerged from the meeting dissatisfied with Mnuchin’s explanation, with House Speaker Nancy Pelosi saying it was “one of the worst” performances she has seen from the Trump administration.